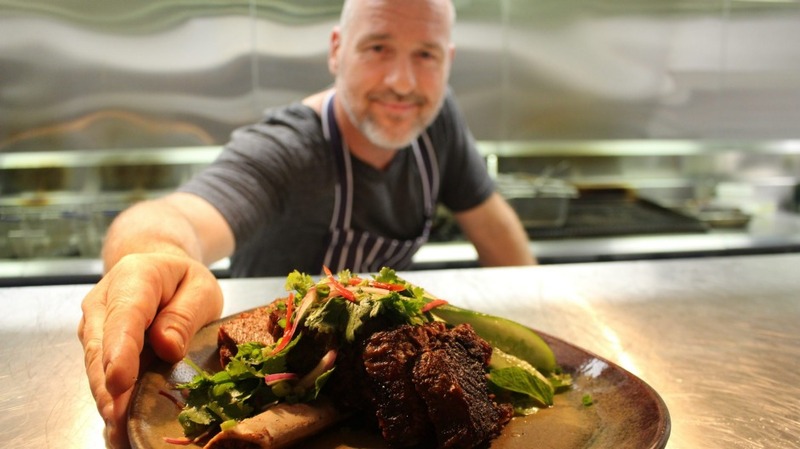 Chef Ty Bellingham has littered the menu with his Thai-influenced dishes. Ty Bellingham is back in the restaurant game. The former head chef at Sailors Thai at The Rocks and Kittichai​ in New York City, who quit restaurant kitchens five years ago to train and place refugees and asylum seekers, has opened Salt Bar and Grill. Bellingham, who trained under David Thompson, will mix a little of his first career with his second, with as many as 10 unemployed at any time being trained at Salt Bar and Grill with the aim of entering the industry as hospitality employees. "My business partner [and former restaurateur] Deanna Lea found the site. We're in a new building that's part of the Bankstown RSL Club, it has 33,000 members and there are 350,000 locals so the potential is good," Bellingham says. The chef will dial back a little on his Thompson training. "Where I might've put two chillis into something it'll only be one," he says. To that end Bellingham has littered the menu with his Thai-influenced dishes, braised short ribs and a wagyu burger. "I don't want to scare people away just yet," he says. "We're using really good produce. And I like to say all the meat is halal except the bacon." Open Sun-Thurs 11.30am-9.30pm; Fri-Sat 11.30am-10.30pm. Salt Bar and Grill, Bankstown RSL Club, 1 Meredith Street, Bankstown.